Keen observers who wonder why, if this is ostensibly a book review, I spent so much time yesterday discussing a) getting my hands on the book, and b) my contentious history with manga. Well, 'b,' I hope, is self-explanatory: I'm using this book as a springboard to reexamine my long-held prejudices about manga, and I'm taking you along with me. As far as 'a,' well, this is the Subway Rambler, after all. 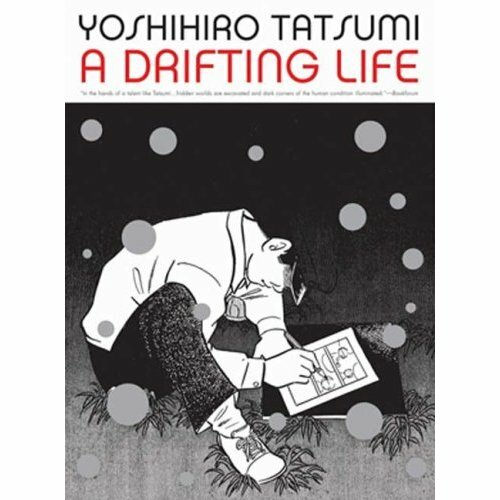 So: before I went off on a tangent, in the first paragraph of yesterday's post, I told you that A Drifting Life is a graphic memoir by Yoshihiro Tatsumi, a veteran manga artist and writer who started his career in the early 1950s at the age of 16. And that's the subject matter of the book - it's essentially a career and industry overview with some human interest bits sprinkled in, covering the first fifteen years of Tatsumi's career. This isn't the first graphic memoir by an established cartoonist, East or West. But the tight focus of this particular book does make it a pretty unique reading experience. Right off the bat, a caveat: Tatsumi fares poorly at constructing a dramatic arc for the narrator. The book is a roman á clef, but even allowing himself the luxury of fictionalizing certain elements (I'm not sure what these are), the overall tone is dry and anecdotal. Dozens of people wander on and off the page with little introduction and sometimes little or no purpose in the overall narrative. Characters have motivations that are either paper-thin and sleeve-worn, or completely obscure and inscrutable - which would be fine in a genuine autobiography, where the author is limited by his own experiences, but in fictionalizing certain aspects, Tatsumi does give us scenes of other people in his life that he couldn't possibly have known about, making speculations about other's motivation that may or may not bear any relation to reality. The reason why this is so distracting is that the entire narrative is delivered in a dry and declarative fashion - things happen and Tatsumi tells us they happened, but never in a particularly illuminating way beyond the basic chronology and dramatis personae involved. The only relationship that ever goes beyond the surface portrayal is that of Tatsumi with his older brother, who shares a close bond but with Tatsumi, but also a competitive jealousy that occasionally boil over. Beyond that, the central character is a cipher - as even the title admits. Someone who is clearly passionate about comics but largely untouchable, at least as presented here. And these are the qualities that I find a lot of manga shares - maybe I'm too steeped in expectations from western literature, but the overly polite and distant tone of A Drifting Life begins to drag the book down after a while. In a shorter volume, it wouldn't be so much of a problem, but at well over 800 pages, you really miss being able to fully connect with a human presence at the core. But: if you can bring yourself to read a novel about a completely passive person, there's actually quite a bit here to make the read worthwhile. But that's tomorrow night.